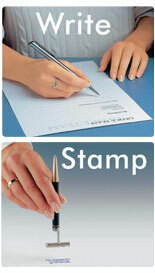 free online custom stamp order service included with each pen. Classic fountain stamping pen. All metal case, middle piece diamond polished. Metal parts chromium or hard gold plated. Elegent stamping pen. Caps, tips and clips nickled or chromium plated.